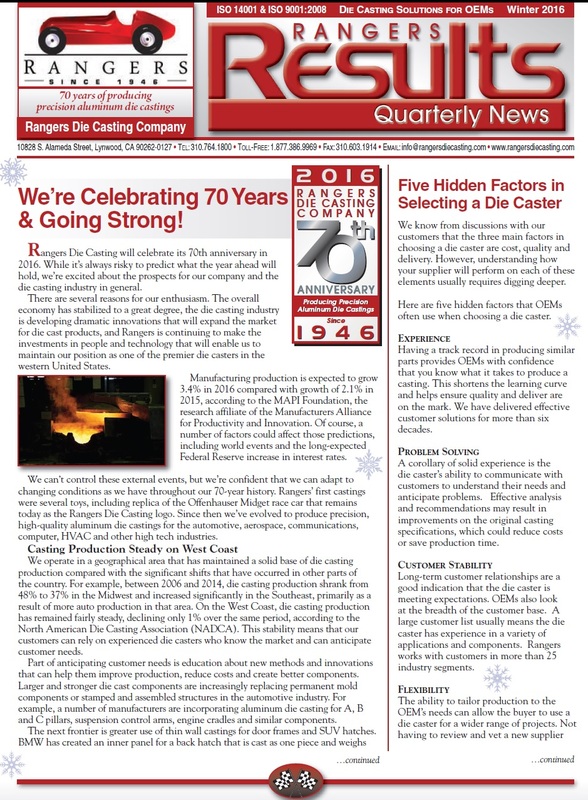 Rangers Die Casting company is one of the West Coast's leading producers of precision aluminum die castings. Our more than 65 years of industry know-how speaks volumes about our diverse expertise as a California aluminum die casting manufacturer. We serve Automotive, Aerospace, Communications, Computer, HVAC, Sporting Goods and other major market segments requiring aluminum die cast parts from five grams to five pounds. We provide these companies with a wide range of aluminum die casting components, aluminum die castings, cast aluminum alloys and metal castings to meet their production needs. Rangers offers complete turnkey service including aluminum die casting design assistance, die cast parts, precision aluminum alloy castings, machining, finishing and assembly. We are members of the North American Die Casting Association. Casting Flexibility - We deliver cost-effective solutions in quantities from 100 to one million pieces a year. There is no aluminum die casting job either too large or too small for the production staff at Rangers. We specialize in cast aluminum parts and die cast aluminum components, giving Rangers Die Casting a competitive edge over other die casting companies. Quality - We were the first and still one of the few companies in the western states that use real-time x-ray technology for on going quality assurance of cast aluminum parts. Our die casting company’s quality control ensures your aluminum die castings meet casting specifications. Quick Turnaround - Our in-house aluminum die casting design, production and finishing ensures that orders are ready when you need them. We do our own precision machining of aluminum alloy castings, complete metal finishing and cast aluminum parts assembly to save you time. Plus, we’re close to our major customers, eliminating shipping lags from offshore suppliers. Experience - We have delivered effective customer solutions for more than six decades. Our aluminum die casting company experience is backed by a stable management team that knows the industry. We know what it takes to produce aluminum alloy castings, complex die cast components and exceptional die cast aluminum parts. Collaboration - We work with our customers to understand their needs and develop effective solutions. Listening to your needs and understanding critical production requirements ensures long-term success and meaningful working relationships. We can help you convert existing parts from other material to cost-effective aluminum die castings using appropriate aluminum alloys. We're very interested in experienced manufacturer's representatives that are well educated in manufacturing and specifically the metalcasting industry to represent Rangers Die Casting regionally throughout North America. Territories available include: Chicago/Midwest, South Central states, Pacific Northwest and Canada. Those interested and qualified should email or phone Don Klements at Rangers outlining their industry experience and compensation requirements.